Admissions documents for Patient #144, admitted to the Friends’ Asylum on June 1, 1824. 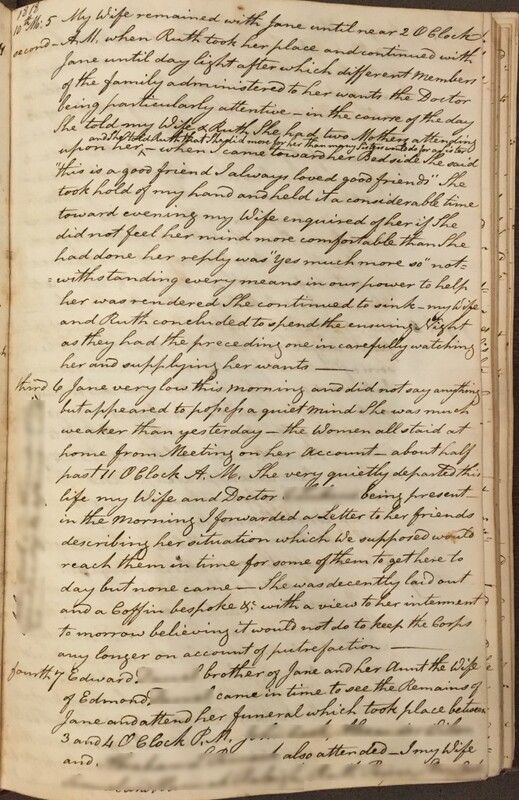 On June 1, 1824, Patient #144 was admitted to the Friends’ Asylum for the Relief of Persons Deprived of the Use of Their Reason. She was 53, married, and had been suffering for a number of years. Her admission documents—the physician’s certificate that guaranteed she was insane and her application for admission—survive along with thousands of other patients’ documents. According to the physician’s report, she had been suffering for about two years, though she had also suffered a similar affliction many years earlier. She was under no regular medical care. 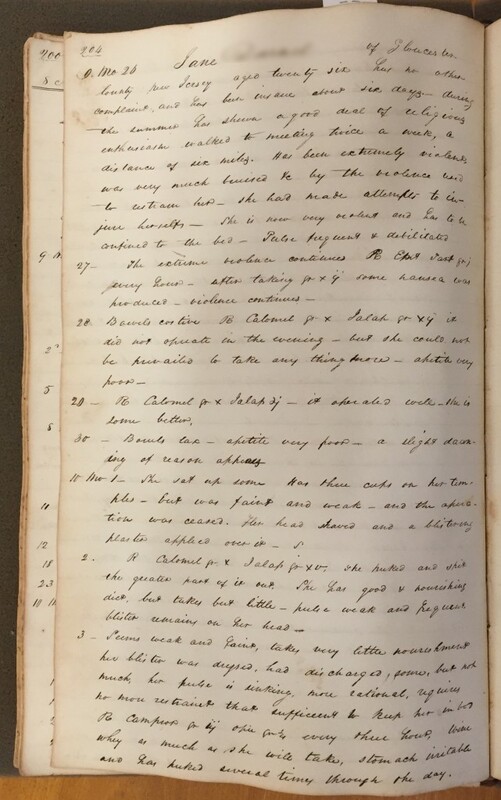 Although she had not attempted to harm herself, her family was “uneasy on the subject in consequence of some expressions from her.” His report was dated April 5, 1824—almost two full months before she was admitted. The same physician noted on May 31 that his initial assessment was still accurate. We don’t know why her husband waited nearly two months before admitting her to the asylum. Once he made up his mind, however, he moved quickly. On June 1 he signed the application for admission, agreeing to pay $3.00/week for her board and to pay for any damage she caused to the “glass, bedding or furniture” and “in the event of her death whilst there [in the asylum] to pay the expense of her burial.” Six months later, following a request from her husband, she was discharged “much improved.” Her story and thousands others like it wait their historians in the Friends’ Asylum archive in Special Collections at Haverford College. 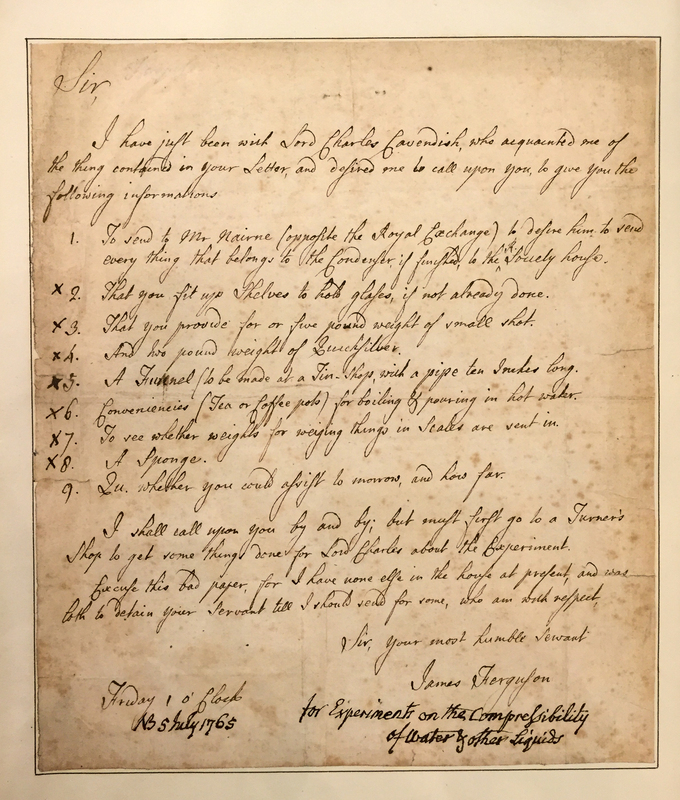 Buried in Haverford College’s Quaker and Special Collections is a substantial collection of autographed letters and other miscellany. Many letters were written by astronomers, mathematicians, naturalists, and others we might call (problematically or not) scientists. Leafing through the collection recently, I came across this letter from James Ferguson on behalf of Lord Charles Cavendish. 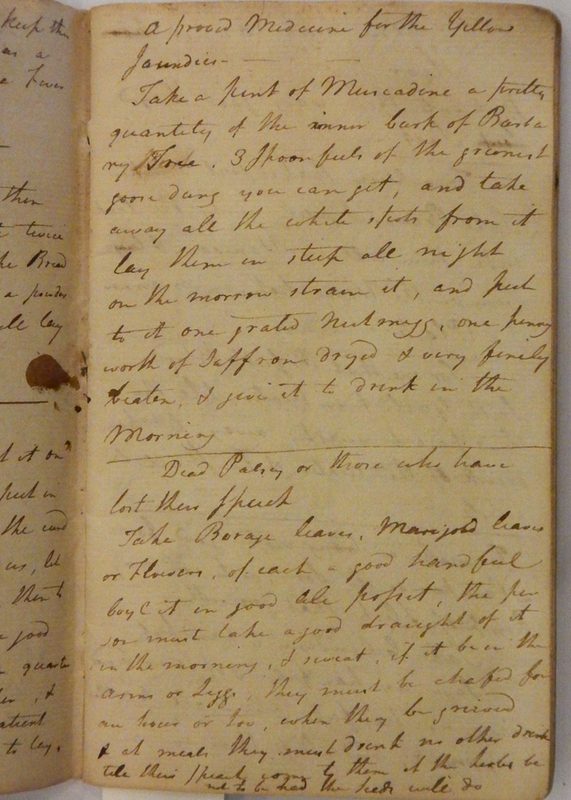 Writing on 5 July 1765, Ferguson seemed to be trying to get some equipment to carry out experiments on the compressibility of water and other liquids (if the note at the bottom of the letter is accurate). James Ferguson’s letter to an unnamed correspondent. Ferguson was assisting Lord Cavendish with experiments on the compressibility of water and other liquids. In the previous few years John Canton had published in the Philosophical Transactions his results on the compressibility of water and other fluids, his “Experiments to Prove That Water is Not Incompressible” 52 (1761–62): 640–643 and his “Experiments and Observations on the Compressibility of Water and Some Other Fluids” 54 (1764): 261–262. The first paper described a his experimental apparatus and reported his findings, that water was compressible. His results disproved commonly held beliefs about the compressibility of water. But his apparatus and method were complicated and his results were, therefore, not universally accepted. He followed up his initial report with further experiments on water and other fluids, e.g., spirit of wine, olive oil, mercury. He confirmed his initial results and, further, found that water “has the remarkable property of being more compressible in winter than in summer,” by which he means cold water is more compressible. At 64° water was compressible only 44 parts per million; at 34° it was compressible 49 parts per million. The other fluids he tested were all less compressible in winter than in summer, i.e., when cold than when hot. He was nominated for a second Copley Medal for these experiments. But before it was awarded, a committee of the Royal Society investigated his results. Ferguson’s letter might give us a glimpse into Lord Cavendish’s efforts to confirm or extend Canton’s results. 1. To send to Mr Nairne (opposite the Royal Exchange) to desire him to send every thing that belongs to the Condenser, if finished, to the R. Society house. 2. That you sit up Shelves to hold glasses, if not already done. 3. That you provide for [sic] or five pound weight of small shot. 4. And two pound weight of Quicksilver. 5. A funnel (to be made at a Tin-Shop, with a pipe ten Inches long. 6. Conveniencies (Tea or Coffee pots) for boiling & pouring in hot water. 7. To see whether weights for weighing things in Scales are sent in. 9. Qu. whether you could assist to morrow, and how far. I shall call upon you by and by; but must first go to a Turner’s Shop to get some things done for Lord Charles about the Experiment. It is tempting to see the X’s next to the items in the to-do list as evidence that Ferguson’s correspondent (who is unnamed in this letter) had completed that task. I wonder what prevented him from attending to the first and the last item? And finally, I find Ferguson’s apology for the poor quality paper fascinating for what it suggests about, inter alia, the letters Ferguson normally wrote (he implied that he typically wrote on higher quality paper), the mechanics of getting better paper (he just sent out for some), and the nature of correspondence at the time (a servant was waiting while Ferguson wrote the letter). A paradox lurks at the center of any archive. One the one hand, archives strive to keep the past alive, or at least on life support long enough for somebody to revive a sliver of that past, which sliver has lain comatose on a shelf locked away in a vault. Yet, on the other hand, the past is dead. Any inquiry into history is “first and foremost an encounter with death.” Sometimes that encounter with death is inescapable. 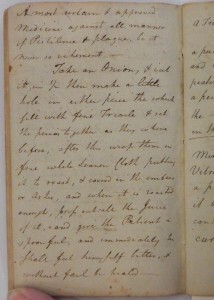 Shelved in Haverford’s Quaker and Special Collections is an archive from the Friends’ Asylum. Volumes of records, daily accounts, physicians’ reports, admissions documents all created for the asylum and its administrators, not for modern historians. The disjunct between the asylum’s needs and intentions and ours is most pronounced, or at least most poignant, in cases of a patient’s death. 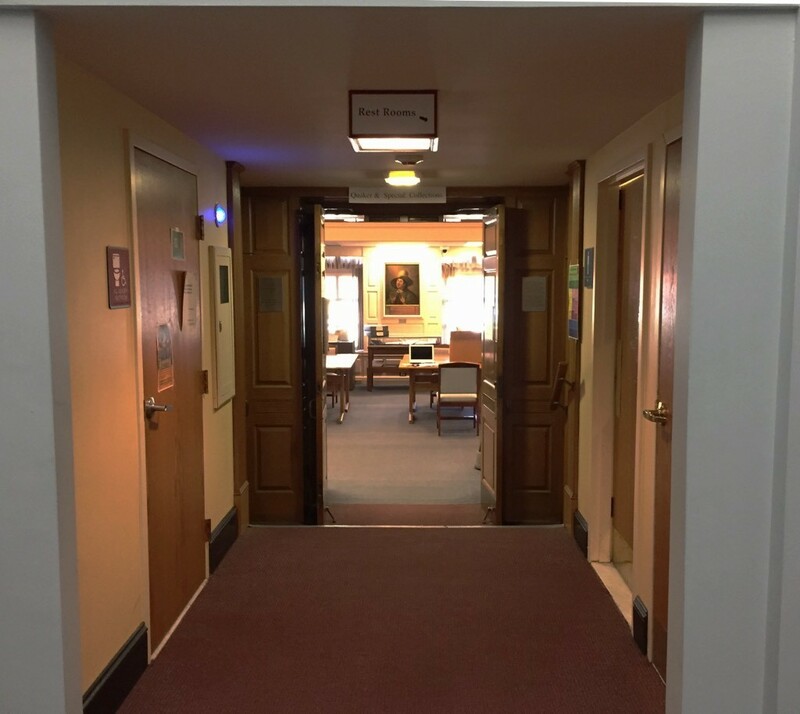 It’s easy to miss entrance to Haverford’s Quaker and Special Collections, with its humble sign taped above the door. Let’s enter the archive and see what we find. You would be forgiven for not noticing anything special about the patient at the bottom of the first page of the Asylum Register of Admissions and Discharges . The entry doesn’t attract your attention. The patient was just one of thousands admitted to the Friends’ Asylum in the nineteenth century, cataloged on the Asylum Register ’s hundreds of columned pages that transform patients into manageable, comparable, analyzable data. 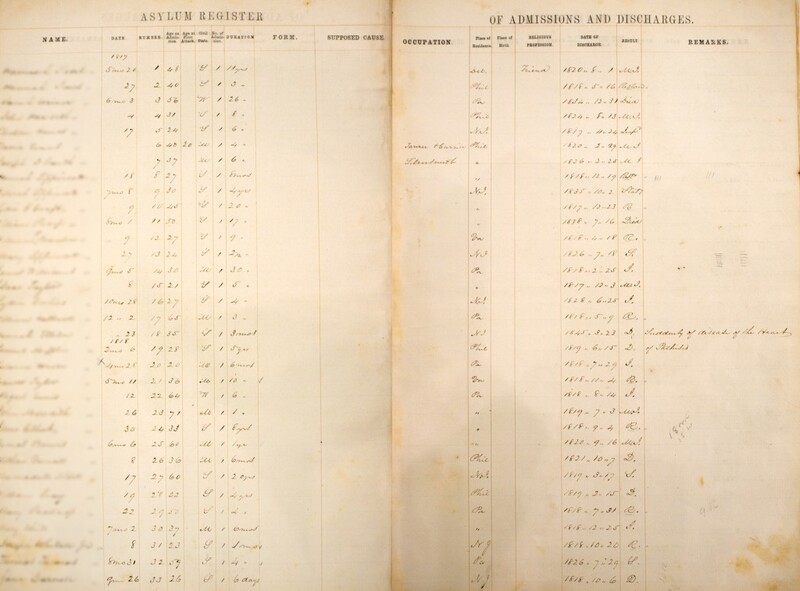 Entries in the Asylum Register from the Friends’ Asylum list various relevant details, including name, date of admission, patient number, duration, occupation, date of discharge, and result. This otherwise dry tabular information hides poignant stories of people now long dead. Patient 33 (at the bottom of the page) was the first patient to die in the asylum, after being there just over a week. The early pages of the Asylum Register lack many details that are noted for later patients. In these thousands of records you lose sight of the individual patient, each on a single row, and see instead columns of numbers. The aggregate becomes the meaningful scale. Even the “Result” column with its list of “Restored,” “M.I.” [Much Improved], “Imp” [Improved], “Status” [Status quo], and “D” [Died] is less the fate of any individual and more institutional bookkeeping that has reduced messy experience to digestible categories, the bookkeeping required to run any institution and to assess its effectiveness. Any given patient disappears into this mass of information. Only with some effort do you notice things about the patient at the bottom of page one. You infer from her name, Jane, that she was a woman. She was admitted on September 26, 1818. Other columns reveal a bit more about her: she was the 33rd patient admitted to the asylum, was 26 years old, single, and from New Jersey. Like five other patients listed on this page, she died before she recovered. If you look a little more closely, two things seem to noteworthy: the duration of her attack had been only 6 days. If you do the math, you realize that she was the first patient to die in the asylum, just 10 days after being admitted. To learn more about Jane you have to turn to the Superintendent’s Daybook. 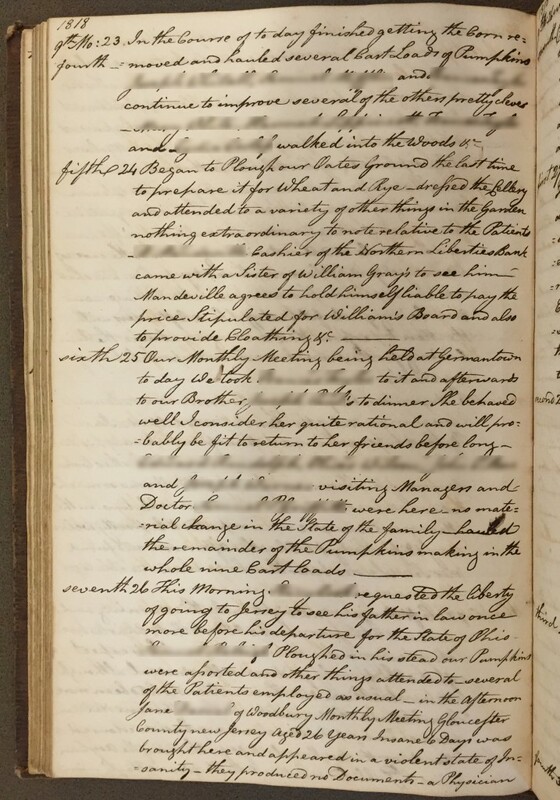 Whereas the Asylum Register transforms patients into analyzable information, the daybook embeds those same patients into the quotidian management of the asylum. The superintendent was charged with recording significant events in the daily running of the institution so that his successors would have a record of how he had managed the asylum. But what counted as significant was open to his interpretation and relative to his immediate concerns, and without any knowledge of what would be considered significant by future readers of the daybook. You read about plowing the fields or hauling in crops or trips to the city alongside comments about patient behavior and his conversations with physicians or visitors. In 1818 when Jane was admitted, the superintendent was Isaac Bonsall. 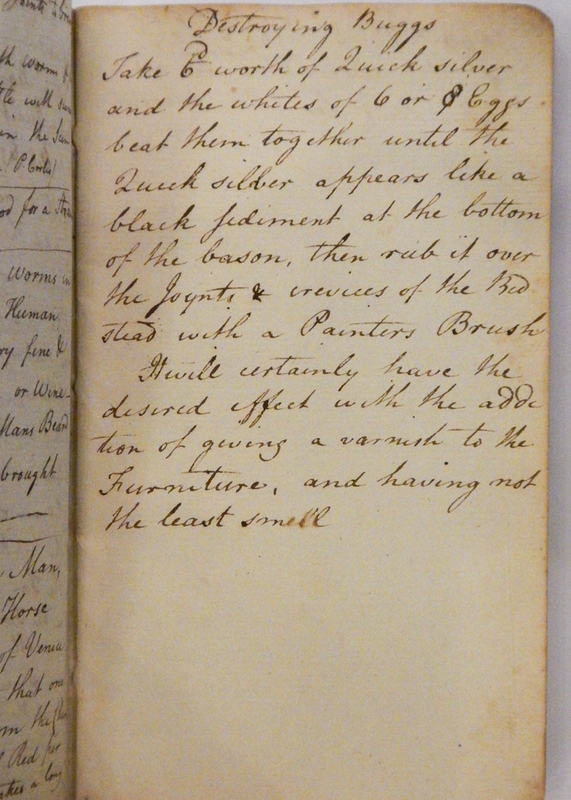 Superintendents were charged with recording the daily life at the asylum in large, bound volumes. Hundreds and hundreds of handwritten pages await the eager reader. in the afternoon Jane of Woodbury Monthly Meeting Gloucester County New Jersey aged 26 years Insane 6 Days was brought here and appeared in a violent state of Insanity—they produced no Documents—a physician was sent for who after examining signed the necessary certificate—as it was evening and dark it was concluded we must lodge & entertain the friends who brought her five Persons and 4 Horses—I obtained a Check for 13 Weeks board and a Bond signed by Edward and Edmond for future pay &c.—the Order for admission is to be obtained and furnished. Isaac Bonsall, the superintendent, noted in the daybook when Jane was admitted to the asylum. His entry reflects his concerns—forms and payment—as manager of the asylum. Bonsall folded Jane’s behavior into the daily management of the institution. It was no more or less remarkable than the foreign visitor who came to see the asylum. Over the next couple days Bonsall recorded Jane’s decline within the framework of overseeing the asylum, the comings and goings of managers, physicians, employees, his trip to the city, the sowing of wheat and rye, and the hauling of manure. Reading Bonsall’s daybook you begin to see Jane as one part of a larger asylum economy. As superintendent Bonsall had manage the running of the institution, entertain visitors, attend to financial issues, oversee labor, and monitor all the patients. His attention and time were finite. He had to allocate both as he judged necessary and within his domains of expertise. He was a manager, not physician. On October 1st Bonsall was worried because an employee had to go into the city just when Bonsall needed him to help “sow several acres of our grain.” While most of the patients were well behaved, Jane was not doing well, so her “head was Shaved and a Blister applied.” The next day Bonsall was occupied with sowing, clearing fields, collecting manure, and hauling crops. He also had to spend time with the visiting managers. Jane did not merit a mention. For two days Jane’s rapidly deteriorating condition consumed Bonsall and the general events at the asylum. 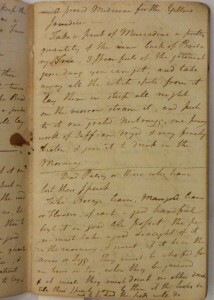 He recorded in detail his and his wife’s attention to Jane. 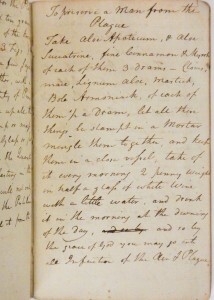 Whatever else happened at the asylum on October 5th and 6th, Jane was the main focus of Bonsall’s attention and all he recorded in his daybook. The next morning Jane’s physical condition had worsened, though Bonsall remarked that her mental state seemed to remain improved, she “appeared to possess a quiet mind.” Then, “about half past 11 O Clock A.M. She very quietly departed this life.” Bonsall immediately sent a letter to her friends so that they could come to see her before the funeral the next day. Her brother and aunt came in time to pay their respects before the funeral, which took place in the afternoon of the 7th. “Jane’s brother and aunt appeared quite satisfied with our Conduct &c. relative to the deceased both before and after death.” With that final comment, Bonsall turned his attention back to the other aspects of running the asylum. You finish reading Bonsall‘s daybook and now know more about Jane, at least more about her arrival, decline, and finally death from Bonsall’s perspective. You see him struggling to manage a growing institution filled with patients each of whom required particular attention. He had to oversee employees and ensure that the institution’s farm ran smoothly. He also had to manage the visiting managers. Bonsall’s understanding of Jane’s case was informed by the demands of his position. Reading his daybooks you sense his profound sadness at having lost a patient, but you also sense his confidence at having done what he could as well as his feeling of accomplishment at having restored her sanity before she died. 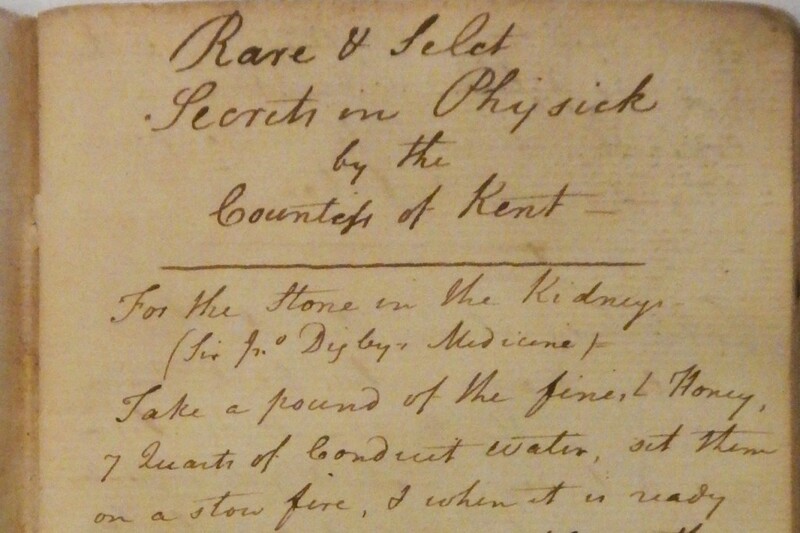 Finally, you turn your attention to the physician’s medical register, looking for more information about Jane. 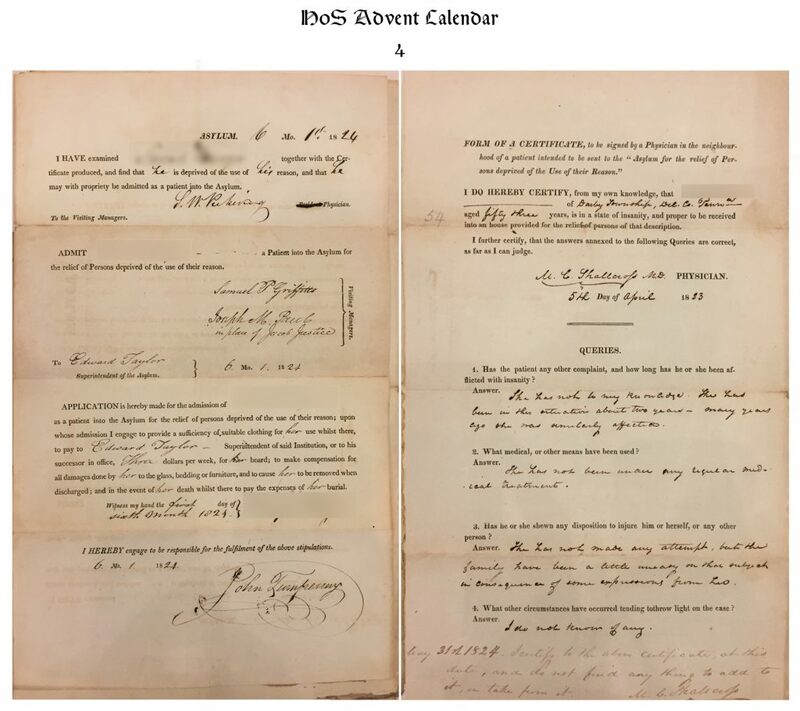 Just as the superintendent was charged with keeping a daybook, during the early years the attending physician was charged with keeping a medical register in which he recorded his observations and treatments for each patient. During Jane’s time at the asylum, Dr. Lukens was the attending physician. You leaf through the volume looking for Jane’s entry and find it on pages 204 and 205. Jane’s final 10 days rendered as a series of medical observations, physical symptoms, and prescriptions. Dr. Lukens’ medical register in which he recorded his observations and the treatment he administered to Jane while she was in the asylum. 9 Mo 26 — …[Jane] Has been extremely violent was very much bruised &c. by the violence used to restrain her—she had made attempts to injure herself—she is now very violent and has to be confined to the bed—Pulse frequent and debilitated. 29 — Rx Calomel gr. x Jalap 2j —it operated well—she is some better. Lukens carefully recorded Jane’s reactions to his treatment as well as her general condition, and adjusted his treatment as her condition changed. When she continued to have no appetite, he gave up the Calomel and prescribed camphor and a mixture of “wine-whey as much as she will take.” He tracked her pulse, which remained weak, and monitored her bowel movements, which remained infrequent. He noted that she was throwing up with some regularity and prescribed “Carbon: amonia” along with the wine-whey and a beef tea. He also applied a blister to each ankle. In the evening he noted that her pulse was stronger and that she appeared better. The next morning he worried that the blisters had “produced a good deal of inflammation but not much discharge.” He changed her prescription again, adding “vol-alkali” along with the wine-whey mixture. He decided to apply another blister this time to her breast. Nothing seemed to help much. 6 — Much restlessness through the night, though she seemed to sleep some…towards morning she swallowed with very great difficulty, after seven oclock she could not swallow anything—and died about eleven. But your task isn’t to judge Dr. Lukens. Instead, when you entered the archive, you agreed to try to understand the past, to understand Dr. Lukens’ efforts for what they were, the best he could offer. There is a more generous and humane approach. Try to appreciate his constant monitoring, evaluating, and revising his treatment in light of Jane’s developing symptoms and their refusal to respond to treatments. Archives are nested experiences. Sort of Matryoshka dolls, each nested account giving you another version of the story, each resembling the others but not identical. Unlike the Matryoshka doll, however, the center of the archive rarely contains some solid core, a single account that can be judged right or wrong. Instead, you end up with multiple versions from which you piece together a history, which unlike the past is not dead but rather vibrant and meaningful. And even the shortest histories are often humbling. Lukens’ frenetic search for medical solutions to help Jane, Bonsall’s sorrow at her death, the asylum’s careful recording of her case all point to an institution struggling to understand mental and physical illnesses. Our shock and horror at Jane’s 10 days in the Friends’ Asylum, her last 10 days, should remind us that future historians and physicians are likely to consider our current efforts equally barbaric. But it’s the best we can do. My experiment in teaching students to ask questions has run headlong into yet another hurdle. Previously I had been persuaded that the students would benefit from an example, so I brought in an old book and tried to show them how I would formulate some questions as I looked at and thought about the book. I wrote up a little set of guidelines for them to take with them as they thought about their books. They nodded at appropriate moments and asked engaged questions, which I took as a good sign. 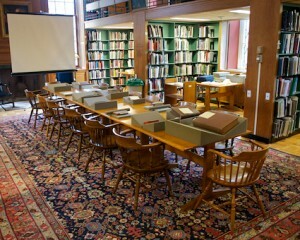 Then I sent them off to special collections to interrogate their chosen book. They have turned in the first iteration of their efforts and seem to be headed on the right track. In two areas, however, their work reveals where I need to provide more guidance and instruction. Clearly, I need to underscore how this information can be used to generate questions. When examining Thomas Browne’s Religio medici I had noted this information for them but had not, I suppose, explicitly connected that information to particular questions. In some cases, I think I did an okay job of it, but for students who are unfamiliar with this approach to texts a little extra repetition would have been useful. A second example on a different day, to reinforce what I had tried to do the first time, wouldn’t hurt. That is not to say they weren’t able to formulate some good questions. Most of them did, or at least came close to good questions. That raises the second area where I need to provide more guidance: What constitutes a good question? Again, for students who have not had the opportunity (or have not been forced) to formulate their own questions, they are unfamiliar with the distinctions between good, fruitful questions and bad, or dead-end questions. Even the difference in types of questions seems a bit blurry for them—some students asked interesting, open-ended questions followed immediately by yes-no type factual questions. Other students posed really interesting questions that were, unfortunately, entirely unanswerable, either because they wouldn’t be able to get to the necessary archives or because the sources simply don’t exist. So, next time, in addition to connecting the descriptive information to the questions, I need to explain why certain questions are fruitful and what precisely makes them good questions. At the same time, I should sketch out how to go about investigating these “good” questions. That said, the students did produce a number of interesting questions that showed they were grappling with the assignment. For example, one student is working on Henry Cornelius Agrippa’s The Vanity of the Arts & Sciences (1694). She asked: “For what reason is the book even now, in 1694, 150 years past the author’s death, being published and circulated? What is its relevance at this time? In what way does it retain relevance?” She is clearly thinking about the meaning of the text in its particular historical context. And this is a question that she can begin to answer by thinking about the intended audience, the translator’s, the printer’s, and the bookseller’s role in producing the text. Another student chose Walter Charleton’s translation of Jean Baptiste van Helmont’s A Ternary of Paradoxes of the Magnetick Cure of Wounds, Nativity of Tartar in Wine, Image of God in Man (London: James Flesher, 1650). She asked a specific question: “Why did Charleton translate this work?” Conveniently, we had recently read Charleton’s Physiologia Epicuro-Gassendo-Charletonia and discussed the rise of atomist philosophy in 17th-century England. The student was interested in the difference between van Helmont’s text and Charleton’s. Again, a nice question that could be used as the core of a research paper. By having the students turn in their descriptions and their questions, I was able to comment on them and suggest ways to refine certain questions, point out where some questions were too narrow while others were too broad. This process could have been streamlined if I had thought ahead and done that in class with Browne’s Religio medici . 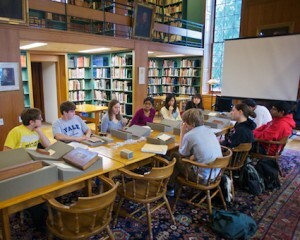 They took my comments and wandered off to special collections again to continue working on their projects. Judging from their most recent efforts, this interim check proved to be useful for them. They had to to present the book they choose, describing the book’s—author, title, size, publication history, owners, etc.—and formulating two or three good questions based on the book. We gathered in one wing of the library with the books arrayed on a large seminar table for the students. Rare books arrayed on the table awaiting the students’ arrival. Students help up their book as they described it, pointing to relevant or interesting bits along the way. In this way, students could hear what their colleagues were doing, how they were going about it, and realize that there were some interesting similarities between projects. They realized, for example, that many of their books were printed by the same person and sold at the same place. One student noted that many of their books had been printed by R. Chiswell and asked if he had printed anything besides scientific texts. Another student, whose book had been printed by Chiswell and included a list of other titles printed by him, was able to list some of the many non-scientific titles he had printed. A pair of students realized that they were working on rather similar texts, both dealing with the medicinal uses of tobacco. One of the students presenting her book—Tobias Venner’s Via recta ad vitam longam (1638) that includes a section on the medicinal uses of tobacco. The resulting conversation was extremely useful. These two students were able to compare their books, the texts, the format, the size, letters of dedication and dedicatees, biographical information about the authors, etc. Another student talks about book on the medicinal uses of tobacco—Giles Everard’s Panacea, or, The Universal Medicine (1659). A portrait of Dr. Giles Everard (from Science & Society Picture Library). In every instance, the students had refined and extended their questions, connecting them more clearly to the books themselves and more often asking fruitful questions. 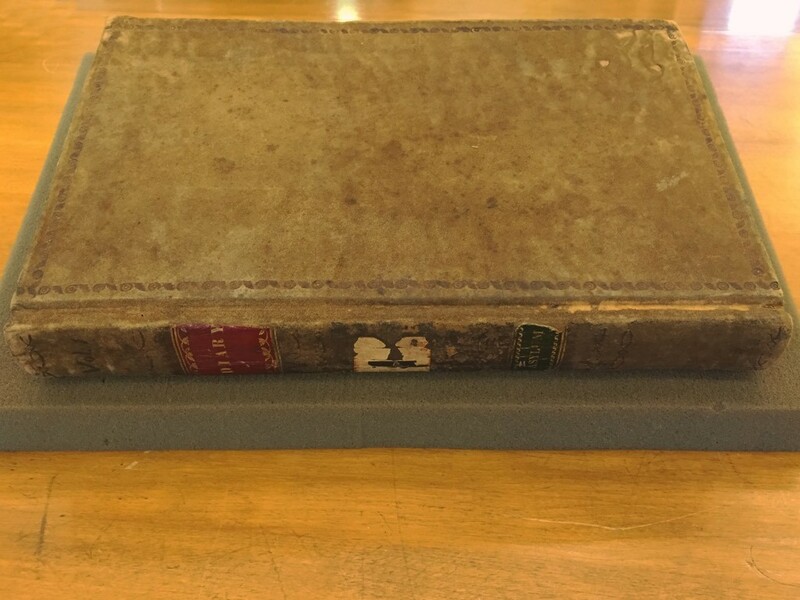 For example, the student working on the Everard’s Panacea asked questions about the intended audience of the text, given its small format, its particular list of merchant dedicatees, and the advertisement for other books at the back of the books. She connected this to the content—Everard was, apparently, interested in keeping tobacco well within the control of physicians rather than letting people become recreational smokers. 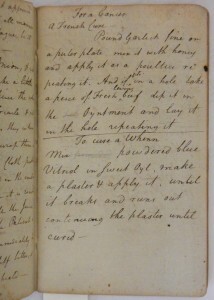 She wondered about the relationship between medicine and commerce: why was a physician dedicating a cheap little book to merchants, and who were these merchants, and what was Everard’s relationship to them? 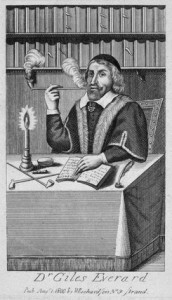 She also posed good questions about how Everard understood tobacco and fit it into existing Galenic medicine. Although she couldn’t answer any of these questions yet, she could articulate them and could gesture to how she might explore them. The other students likewise were able to link their questions to their books in interesting and concrete ways. And they formulated clear and open-ended questions. And they had begun thinking about the relationship between the artifacts and the questions. When a student finished present a book, the other students had specific questions to ask, often arising from their own books—e.g., my book too was written in the form of a letter, what does this say about the accepted forms for writing about science in the late 17th century or my book is any English translation of your text printed a decade later, what does that say about the market for this book? What this exercise seems to indicate is that students can begin to ask questions when given the chance or when compelled to do so. They don’t yet seem comfortable with this approach—answering questions remains their strength, but they are making progress. Clearly, providing them with models of how to ask questions is not, in itself, sufficient. They don’t immediately see the connections between the descriptive exercise and the generation of interesting questions. On the one hand, they don’t yet see books as historical objects whose meaning and significance is related to a particular time and place. On the other hand, they don’t have a good appreciation for the different types of questions. Consequently, articulating the connections between description and questions is necessary—how does that questions arise from those aspects of the book—as is some explanation of what makes one question good and another one bad, and why. All of this is leading up to the first major part of their research project: the proposal—a term that means little or nothing to most students. This exercise in pedagogy has been aimed at getting the students to understand what makes a good proposal without invoking the term itself. Previously I was convinced that student research papers would improve if we concentrated on the research, formulating, crafting, and writing. While these aspects certainly need attention, most research papers go awry much earlier in the process because the initial question is poorly formed or the wrong sort of question. The goal is to help students learn how to recognize and formulate good questions and, equally important, how to investigate those questions. The next installment of this project will assess how well I have succeeded or how miserably I have failed at the goal. 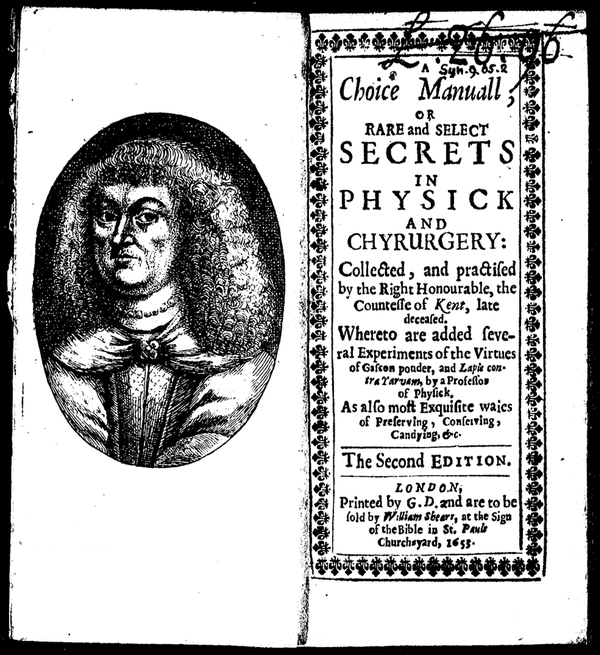 A choice manuall, or rare and select secrets in physick and chyrurgery collected, and practised by the Right Honourable, the Countesse of Kent, late deceased. Whereto are added several experiments of the virtues of gascon pouder, and lapis contra yarvam, by a professor of physick. As also most exquisite waies of preserving, conserving, candying, &c. (London, 1653). The Countess of Kent’s recipes were clearly popular. Expanded versions of the book were published at least nine times before the end of the century, 1654, 1659, 1661, 1663, 1664, 1667, 1671, 1683, and 1687. More than a century later her recipes were still circulating such that Scattergood could copy them. The Countess of Kent’s A choice manual of rare and select secrets in physic was a popular recipe book in the latter 17th century. 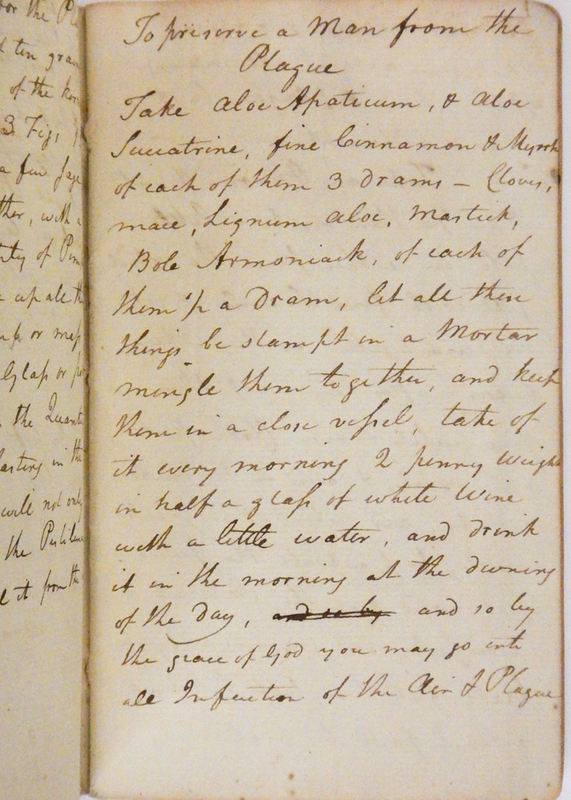 One of the many recipes for the plague Scattergood copied from the Countess of Kent. 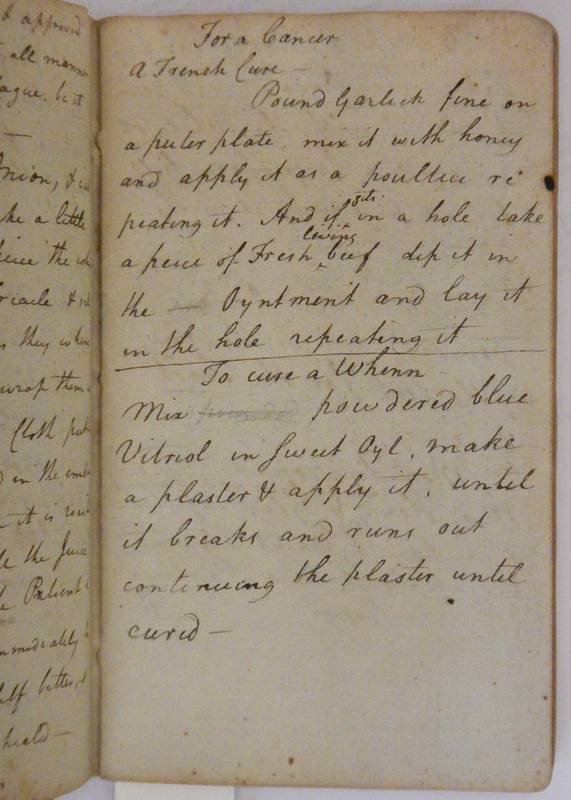 Take aloe Apaticum, & aloe Succatrine, fine Cinnamon & Myrrh of each of them 3 drams—Cloves, mace, Lignum aloe, Mantick, Bole Armoniack, of each of them 1/2 a dram, let all these things be stampt in a Mortar mingle them together, and keep them in a close vessel, take of it every morning 2 penny weight in half a glass of white wine with a little water, and drink it in the morning at the dawning of the day, an so by the grace of God you may go into all infection of the Air and Plague. 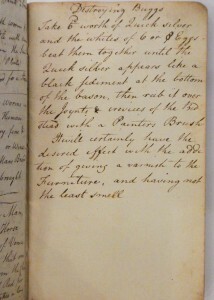 Another plague recipe from the Countess of Kent. Take a pint of Mucadine a pretty quantity of the inner bark of a Barbarry Tree, 3 spoonfuls of the greenest goose dung you can get, and take away all the white spots from it, lay them in steep all night on the morrow strain it, and put to it one grated Nutmegg, one penny worth of Saffron dryed & very finely beaten, & give it to drink in the Morning. Take Borage leaves, Marigold leaves or Flower, of each a good handful boyl it in good Ale posset, the person must take a good draught of it in the morning, & sweat, if it be in the arm or Legs, they must be chafed for an hour or two, when they be grieved & at meals they must drink no other drink till their speech comes to them, if the herbs be not to be had the seeds will do. Mix powdered blue Vitriol in a sweet oil, make a plaster & apply it, until it breaks and runs out continuing the plaster until cured. Into a clean pipkin that holds about a Quart put the bigness of a Pullets Egg of yellow rosin when it is melted over a midling fire add the same Quantity of Bees was, when that is melted pu t in 1/2 a pound of hogs lard when that is melted put in 2 ounces of Honey, when that is melted put in 1/2 a pound of common turpentine, when that is melted put in 2 ounces of Vardigrease, take off the pipkin or else it will [??] in the Fire in an Instant; put it on the Fire again and give it two or 3 wabbles & strain it through a course Sive into a clean Vessel through the dreggs away—An Extraordinary Ointment for a wound or a bruise — Nothing takes the Fire out of a Burn or scald so soon. A recipe for killing bed bugs and polishing furniture. It will certainly have the desired effect with the addition of giving a varnish to the Furniture, and have not the least smell. 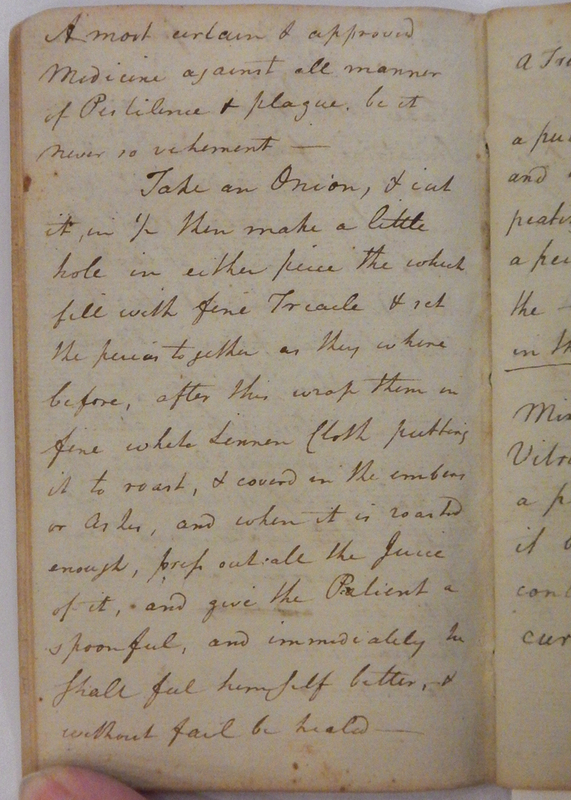 What we can’t tell from Scattergood’s diaries if he used any of these recipes or if he found them effective. We also can’t tell if he adapted them to reflect the ingredients available to him locally. Maybe clues to those questions are hiding in some of the other Scattergood papers. A Medicine for a Wen.